Eduardo “Lalo” Portillo finishes off his junior career with an 18U world title. … as does Montserrat “Montse” Mejia. 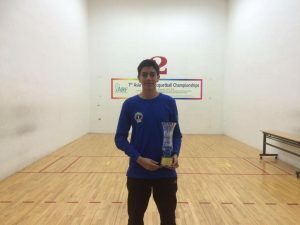 The final International Racquetball Federation – IRF event of the season has finished up and new World Junior titlists have been crowned. Congrats to all the winners. Here’s a review of the four eldest-most age categories (the ones that www.proracquetballstats.com currently tracks) and how the tournaments played out. The two Americans both fought hard but fell at the quarter-final stage. Los Angeles native Dane Elkins took #1 overall seed Fernando Ruiz Michel to a tiebreaker, and Stocktonian Ricardo Ricky Diaz (brother of IRT pro Jose Diaz) played #3 seed Bolivian Gerson Miranda tough, eventually falling 13,12. The two Mexican top seeds both advanced tot he semis with ease. In the semis, it was Bolivia vs Mexico on both sides of the draw … and it was both Mexican’s advancing to the final to force a rematch of the Mexican Nationals final in May. #4 Eduardo Portillo Rendon took out #1 seeded Fernando Ruiz Michel in two hard fought games, while #2 Sebastian Fernandez cruised past #3 seeded Gerson Miranda. In the Final, we got a rematch of the Mexican 18U Junior National final from past May (won by Fernandez), the 18U selection event final in Mexico (again won by Fernandez) and a rematch of the 2016 16U World Juniors final (won by Portillo). On this day though, Portillo was the better player, dropping the first game 14 then cruising to the title (14),4,7. The knock-out rounds featured all four top seeds advancing with relative ease into the semis; only #4 Gaby Martinez had more than 3 points scored against her in any quarter-final game, downing Canadian Alexis Iwaasa 9,5. In the semis, Martinez took out the #1 seeded Mexican Ana Laura Flores with ease 5,3, while #3 Montse Mejia took a close match against #2 Angelica Barrios 14,8. The Final thus was a rematch of 2017’s 18U world championship (won by Mejia), and of the 2016 16U World championship (won by Martinez), and represents a fitting end to both players’ junior careers. A fantastic match ensued, with Mejia taking the first game 14, dropping the second game 8, then controlling the tiebreaker to down the reigning World Champ and defend her 18U world championship. Final score: 14,(8),6. Martinez is denied a chance at becoming just the second player ever to hold both a Junior and World Adult singles title simultaneously. The two top seeds advanced to the semis with little fan fare, with #1 Jose Carlos Ramos topping Texan Cayden Aikens in two, and #2 Bolivian Diego Garcia Quispe getting an injury fft win. #12 seed Mexican Guillermo Ortega “upset” the #4 seeded Bolivian Adrian Jaldin (though Ortega was the #3 seed entering the round robins) to make the semis. Lastly American #6 seed Sahil Thakur could not capitalize on a one-game lead and fell in a tiebreaker to #3 seed Ecuadorian Juan Sebastian Flores. In the semis, Ramos topped fellow Mexican Ortega a rematch of the 16U National selection event in August (also won by Ramos), while pre-tourney favorite Garcia pasted Flores 3,2 to advance to the World final. In the final, Garcia took a dominant win 4,10 over the #1 seed to take the title. Garcia did not drop a game in this tournament, and the 15-10 second game in the finals was the most any player scored on him in this tournament. He’s set to be a force to be reckoned with going forward. The top four seeds advanced to the semis, taking out both Canadians (Juliette Parent and Cassie Prentice) as well as the lone remaining American (Annie Roberts). In the semis, #1 seed Valeria Centellas advanced over the Mexican Guadalupe Griffin 5,10 while #3 Costa Rican Maricruz Ortiz topped the Mexican #1 Maria Fernanda Gutierrez, making for the only of these four finals to feature no Mexican juniors. In the final, Centellas dropped the first game 9, then dominated the rest of the way, taking the final (9),4,3 to take the world 16U title for Bolivia. – Boys 18U final featured four of the best singles players in the tourney, as Mexico and Bolivia went at it in a rematch of the scintillating RR match. In the final, the Mexican team of Fernandez and Rodrigo Rodriguez came out on top, getting revenge for their RR loss to the Bolivian team of Fernando Ruiz and Gerson Miranda for the title. – Girls 18U final featured the top Mexican team versus Ecuador. The Mexican team of Ana Laura Flores and Abril Sacristan cruised to a world title. – Boys 16U also featured Mexico vs Bolivia in the final (like the 16U). The Mexican team had to play just one match to get to the final (getting a bye and an inj-fft), but could not overcome the Bolivian team powered by the singles champ Garcia. – Girls 16U was Bolivia vs Canada, who ousted the higher seeded Mexican team in the semis. On this day the Bolivians cruised to the title 8,7 over team Canada. The Girls 16U final was notable for this fact; Bolivian Valeria Centellas won the Adult World doubles championships earlier this year with Yazmine Sabja Aliss and now holds the 16U junior worlds doubles championship … as far as we can tell, this is a first in the international game (having a player hold both the Adult and the junior world title in doubles). A quick note: as we’ve clearly been seeing for a while, the balance of power both in Juniors and on the pro tours is clearly no longer with the originating countries of the sport. USA and Canadian players failed to advance to even the semis in either 16U or 18U. 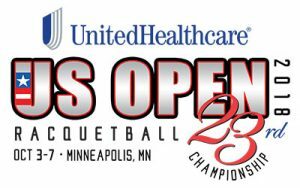 Team USA did experience some success; the Americans swept the 14U doubles titles, made the finals of both 14U singles events and American Nikil Prasad won the boys 12U in dominant fashion. But the older levels were completely dominated by Mexico and Bolivia.